So now that we know what Bounce Rate is, it is time to tackle the numbers! For those who love love stats and numbers, this is going to be a lot of fun. It is very easy to slice and dice the data a kazillion ways. For the rest of us, I pulled out three areas that can help keep us focused on using the analytical data, without being overwhelmed! Bottom line: Analyzing these three areas of site use and interaction will give us what we need to assess effectiveness. One of the improvements in Google Analytics is that you can see graphs and data side by side. 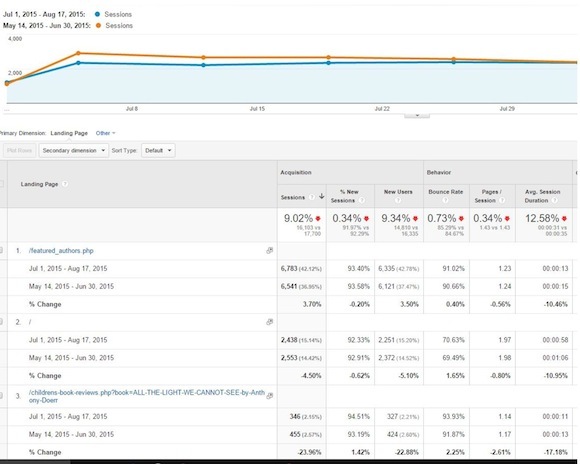 This screen shot answers two questions for me: what is my site bounce rate (85.35%) and how does that compare with how many pages people visit per session. My Takeaway: Even though my bounce rate is high, on average people are clicking at least one additional page on my website. Not great numbers, but knowing visitors are going to a second page gives me something to work with! Depending on how you’ve structured your site, and whether or not you use products like Google AdWords, visitors can “land” on any number of pages, not just your home page. This screenshot presents an image of the pages that people “land on” as a result of Internet searches. The way I structured the query, I asked Google Analytics to compare two periods of time, so that I could see any changes. This is particularly helpful for looking at seasonal activity or any campaigns (Ads) I may have sponsored. My Takeaway: The Featured Author page (which explains how authors can request interviews) is is the page that is most visited from search engines. It also has one of the highest bounce rates. There would seem to be a disconnect between the ad (keywords) and the page content. More research is needed. Understanding keyword effectiveness not only helps with SEO and conversion online, but it can also give you insight into off-line advertising and marketing. What are the words that are most effective in getting – and keeping – potential customers’ attention? Which ones aren’t working the way you expected? The answers can help you in crafting copy for your media kit, print and radio ads, etc. As a 501(c)(3) The Reading Tub benefits from a Google Grant for AdWords. We are given a budget to work with, so it is very important that we “spend wisely” and build Ads that have very strong links between keyword term and conversion. This is a screenshot of the top 20 keywords (i.e., the words that get the most clicks from Internet searches). My Takeaway: The Reading Tub offers book reviews of children’s and young adult books. Two of the most important keywords (reading sites for kids, free book reviews) have bounce rates that are above average for our site (85.35%). The best performing keyword (in the top 20) doesn’t have the word “book” in it. 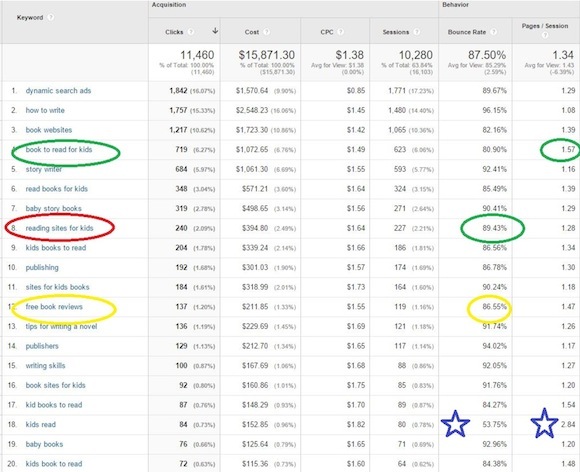 I need spend some time with a keyword tool to maximize the better performing terms, and further refine the underperformers. As I mentioned at the beginning of the article, there are a kazillion ways to parse data to get more insight into how your website / blog are performing. Comparative data can be particularly useful in measuring engagement and effectiveness over time, as well as in contrasting / comparing the impact of specific changes or events. 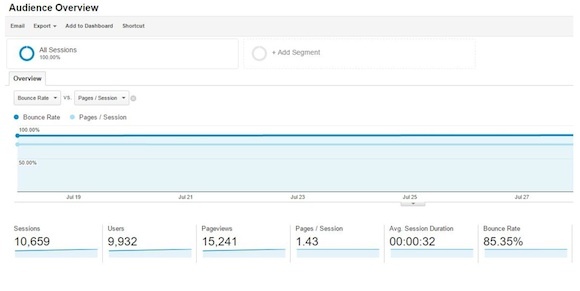 Google Analytics Screenshots – courtesy of Terry Doherty. All rights reserved.